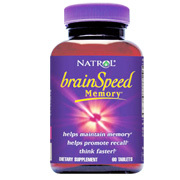 Natrol brainspeed memory helps improve cognitive processing speed, promote recall and maintain memory. It is specifically formulated to support mild memory problems associated with againg. Directions: Take 1 tablet, two times daily, preferably in the morning and afternoon, with a meal. Do not exceed recommended daily intake. Consult your healthcare professionalprior to use if you have or suspect a medical condition or are taking prescription drugs. Do not use if you are pregnant or lactating. Not for use by individuals under the age of 18 years. Other Ingredients: Cellulose, Mono and Diglycerides. Carob, Dibasic Calcium Phosphate, Cellulose Gum, Dextrose, Stearic Acid, Silica, Magnesium Stearate, Methylcellulose, Natural Food Glaze, Glycerin, Maltodextrin. No Yeast, Wheat, Corn, Milk, Egg, Glutens, Artificial Colors or Flavors, Starch or Preservatives. Brain Speed Memory is shipped in a discrete, unmarked package. Orders are processed immediately and usually take about 3 to 5 working days to be received. We do ask that you try it for 2 to 3 weeks to feel the full effects. Any information received is used only for order processing and shipping purposes. Your information, such as e-mail address, will never be disclosed to a third party.